Okay, take a story that will already appeal to young horse fans. Add excellent narration and awesome sound effects. What do you have? You have the perfect recording to hand to young readers. 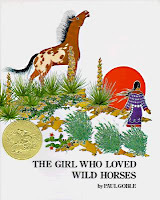 In this Caldecott-winning picture book, a young Native American girl takes care of her people's horses. When a thunderstorm scares the herd, the young girl is whisked away with them. The lead stallion welcomes her and the girl becomes part of the herd, happier with the horses than with her own family. Realistic sound effects like thunder and hoof beats make the story come to life. One thing I really love about Weston Woods recordings is that they have such great music. Hansel and Gretel is no exception. A lively score plays under the narrator during the whole story and it really adds a lot. This familiar fairy tale features brother and sister team Hansel and Gretel. When their mom leads them into the woods in the hopes of getting rid of them (how did she find her way back home, I ask you? ), they end up eating pieces of the witch's candy house. The story might be a bit disturbing to younger preschoolers, but kids who know the story will delight in this wonderful recording. Speaking of wonderful Weston Woods recordings, I can't recommend the Duck books enough. Lively banjos and fiddles accompany much of this farm story and it's punctuated with animal sound effects (including a very Donald-Duck-esque duck snicker). 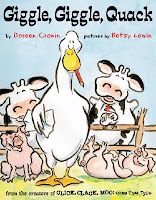 This sequel to Click Click Moo, Cows That Type has Farmer Brown leaving the farm in the care of his brother. "Just follow my instructions and everything will be fine," Brown says. But when Duck gets his wings on those instructions, some very funny things start to happen at the farm. This is a surefire hit with the preschool crowd.